Robinson Chirinos also homered for Houston, which won its eighth consecutive game. The Mariners lost their second in a row following a six-game winning streak. The Astros and Mariners wrap up their three-game series Sunday afternoon. 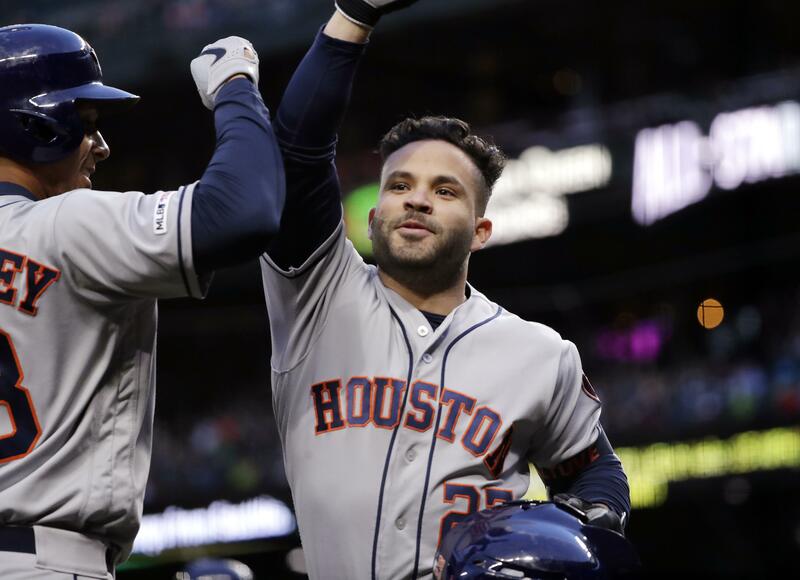 Verlander (2-0) allowed one run – a solo homer by Mitch Haniger – on two hits. The right-hander didn’t walk a batter and struck out 11. He threw 105 pitches, 76 of which were for strikes. Seattle’s Felix Hernandez (1-1) took the loss despite a quality start. Hernandez allowed three runs on six hits in six innings, with one walk and five strikeouts. Haniger’s homer made it 17 consecutive games to open the season in which the M’s have gone deep, extending their major-league record. It was only the third time in 17 games this season in which the Mariners failed to score six or more runs. M’s left-hander Wade LeBlanc is likely to miss some time after straining his right oblique muscle during the fifth inning of Friday’s 10-6 loss to the Astros. Top prospect Justus Sheffield pitched for Triple-A Tacoma on Friday night, so he could easily slide into LeBlanc’s spot in the starting rotation if he misses a start. 3: The number of times in 17 games this season the Mariners have failed to score six or more runs. Combined, Justin Verlander and Felix Hernandez have won 375 games, struck out more than 5,000 batters, been All-Stars 13 times, won two Cy Young Awards (one each) and made nearly $450 million. While it wasn’t a circa 2010-11 showdown, when they won back-to-back Cy Youngs, Verlander was strong and Hernandez posted a quality start. That’s about all you can ask these days from King Felix, the M’s fifth starter, and he delivered. The M’s will try to salvage the final of their three-game series with the Astros as LHP Marco Gonzales (4-0, 3.16 ERA) is set to face Astros RHP Gerrit Cole (0-2, 3.32). Game time is 1:10 p.m. at T-Mobile Park. Published: April 13, 2019, 9:10 p.m. Updated: April 13, 2019, 9:10 p.m.